Among the masters of marketing in the Christian world are Bible publishers. Name your favourite Bible teacher, theological preference, addiction, colour, binding material, or translation, and there’s a Bible published with that target audience in mind. For the most part, my thought on this is, Hey, if it gets people in the Word, go for it. But there is one that can, sometimes, do less good than we think. 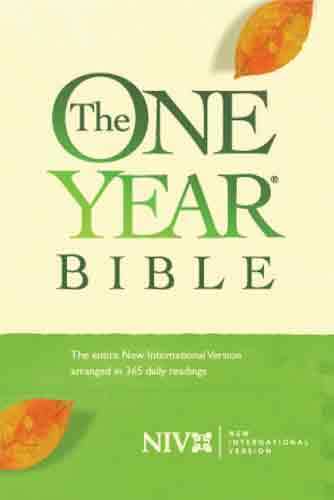 It’s the “one year” Bible. Now, I know that the editors and publishers are of noble intent; their goal is to get people to read the Bible every day for a year, and they’ve created a rubric to make that happen. And I’ll gladly admit that I’d rather someone read the whole Bible in a year than not read it at all, or read it only sporadically. My quarrel with this approach is simple: reading the Bible isn’t a race. My contention – not original, by any means – is that the Bible is intended to be a love letter from God. And the last time I checked, nobody speed-reads a love letter. When we get a love letter, even a card, we hang on every word, reading it over and over again, so we can take into the depths of our being the intended expression of the writer. Too often, reading through the Bible in a year seems more like a task to be accomplished and ‘checked off the list’ rather than a delight in which we savour every word. Don’t get me wrong: I am glad to see people read through the Bible, and I encourage it. But I would rather see someone take 5 years to read through the Bible, listening for God to speak through his Word and prayerfully lingering over passages as the Spirit guides, than to rush through it and simply say it’s been done. By all means, follow a Bible reading guide if that helps you; different options are available from organizations such as the Canadian Bible Society. But if it takes you longer than a year to get through it, don’t beat yourself up. It could be that the Lord prompts you to read the same passage every day for a week; if God has a message for you from that passage and it takes a week for you to absorb it and begin to apply it in your life, so be it! There’s no ‘best before’ date on the Bible – all of it will still be there when God prompts you to leave one passage and move on to another. Linger over the Word prayerfully. If God encourages you to spend time meditating even on a phrase, or a word, then do it. It is time well spent if that’s how the Lord is going to speak to you. In that intimate time, you might even find yourself memorizing some or all of that passage, and that’s God at work in you, too – if my own experience is any gauge, you’ll probably find that memorizing a passage comes in handy for a situation in which you’ll find yourself later on. Do read the Bible every day, but don’t feel you need to get through it in a specified period of time. Savour the Word. Enjoy the Word. Let God speak to your heart through it, and your relationship with him will be deepened even more. “I seek you with all my heart; do not let me stray from your commands. I have hidden your word in my heart that I might not sin against you” (Psalm 119.10-11, NIV).